My Jordan on the plane.... window seat, my favorite seat! you can see the water from the entrance to the W hotel! Me and one of my most precious friends Tamara...she lights up a room with her joy...and I just adore her! So excited she calls Seattle home now...and I get to see her sparkling eyes! She has been with me through some of the not-so-fun times in my life....I love you Puddin'! The W Hotel where the Glaminar will be tomorrow is GORGEOUS!!!! We spent the afternoon making giftbags, setting up the room, arranging everything, unpacking boxes...which is where I sent a box-cutter into my thumbs trying to cut this plastic zip tie of the Vanity GirlHollywood Pink Starlet mirror that will be given away tomorrow....nothing a tightly applied band-aid couldn't fix! Tamara drove us to dinner...then the best part....we waited in line to get homemade ice cream at Molly Moon's, this line practically wrapped around the street for the tastebud wonders inside! oh my deliciousness! The guy scooping mine up said it's there most popular flavor...and I know why! then we returned to the hotel room...to find a beautiful tray of chocolate cupcaked with gold leaf on top, sunflower seeds, a fruit basket, and a big bottle of Fiji water...with a precious card from Casey that works in the W bar, saying she is a fan! I had to go find her and hug her and thank her! Aww, looks like you're having the best time! Thanks for updating those of us who can't make it out with you. You're amazing Kandee! Have a fabulous Glaminar! You have such amazing energy kandee! You seem right at home in Seattle. My birthday is coming up in a week and everytime someone asks what I want, I just say a few bucks. I'm hoping to save up enough to come to at least one class in Chicago. Is it too late to sign up? Enjoy Seattle! Sending tons of love your way Kandee. 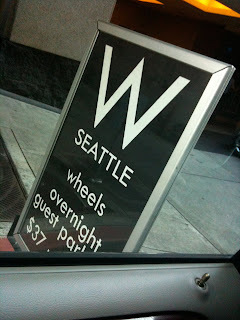 I stayed at that W when I was in Seattle last summer. It's a great place. What a fun city. I hope your glaminar goes wonderfully! awww Welcome to Seattle! Definately stop by the International District/Chinatown! :) must hit up the Uwajimaya store as well ;)! I'd love to meet you! BTW! Saturday night (7/31/2010) is the Torchlight Parade that starts from Seattle Center to Safeco Field (it goes thru Downtown Seattle!) hope you have fun with your stay in Seattle :)! 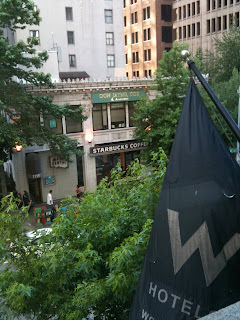 I wish i could join you in Seattle! Have a great time! Oh such a nice post :)!I wish you all good on the Glaminar. U have a great time, we're cheering for u. Sleep well! (If at all). 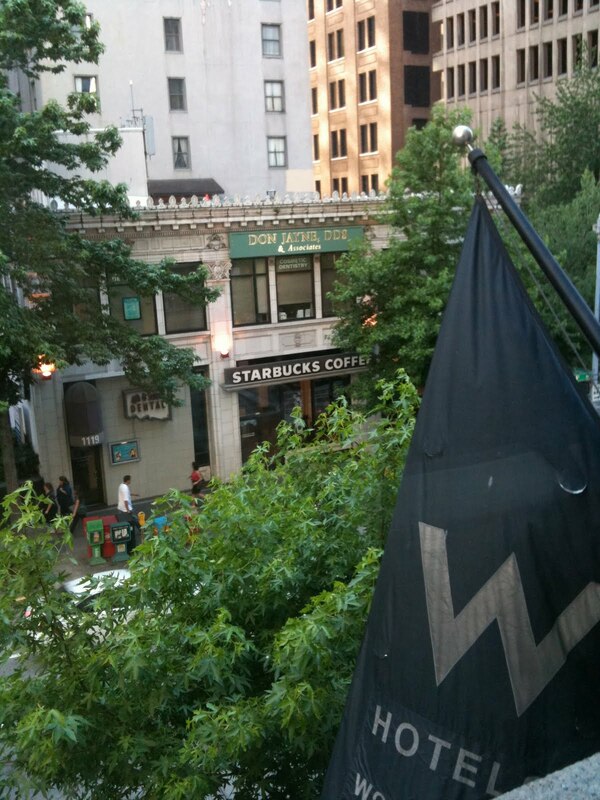 ahh Seattle looks so pretty! =) But Jordan, Tamara and you look a lot better! Sounds like so much fun Kandee! You deserve the best! Those seattle gals are lucky to have you! Awee, loved your post..! thanks for typin' it for us, even though you were tired.., you're amazing you kno :)..
you must be very excited! I've never been to Seattle but I definitely want to make a visit in the future! I hope you have fun in Seattle Kandee. I wish to visit there someday, it sound like a nice place to visit. I love that Sleepless in Seattle movie, I watch it like 4 times already..^_^ Have fun today Kandee!!! Yay, Kandee!! So much fun!! I'm sure the Glaminar will be Ah-Mazing :) Can't wait for ATL!!!! Woohooo!!! Lots of love! Thanks for the fun update! I just found you on YouTube last week and I'm now a HUGE fan!! BTW..You have my dream job! lol Good luck and keep on smiling! It's contagious, you know! you can write me back on my blog or email. either way! I hope you enjoy Seattle Kandee! It's my hometown, born and raised and now that I live in Austin I miss it so much! I'm sure the Glaminar will be fantastic and so much fun and you are so lucky you got to be there in the summer months with the weather is nice and the sun is shining. Live it up. Its a great city with great people. Oh my gosh that looks awesome! I'm from texas so any scenary I see is the sky, lol. 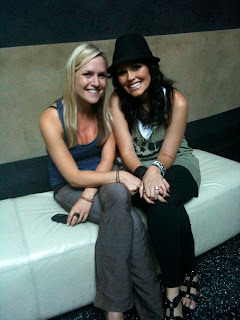 I love your blogs Kandee and you are truely beautiful inside and out. You have the most purest heart I've ever seen. You help me keep up my spirit which is so hard being bc I'm around people that bring me down. Not in the way that they make me feel bad but in the way that I live my life. Your awesome Kandee and I'm such a big fan of yours (You probably get that a billion times a day). I defiantly see someone wonderful in you that God has shown me I can be just like you; help girls and be a sister to them. You are someone I look up to the fullest even though I'm not taking my career anywhere towards makeup I still use your videos and I feel my spirit more fullfilled when I see them. Thanks Kandee for becoming such an inspiration in my life! George town cupcakes as seen on tv. Reaaly famous. Seattle is really nice. Hope your Glaminar is great! Hi Kande, glad your having fun girly! If you like sushi go to Benni Hanna (not sure how its spelled) in downtown Seattle. They have AMAZING sushi. Have a safe flight home. Still hoping, wishing, and praying to meet you. Seattle sounds lovely! YUM, salted caramel ice cream sounds divine! my current fave flavour has to be Praline and Cream from Baskin Robbins! You seem so sweet and grateful for everything that you have and get. I would really love to meet you sometime, I bet you radiate everywhere you go and everyone who sees you with happiness and light! Kandee, please tell me you are going to do a Glaminar for IMATS NYC in April 2011? love you kandeee i want you some day here in chile!!!!!! I've never been on a plane I wonder if i would sit on the window seat or the isle seat LoL. Think I would be scared hahaha. OMG I was there this past weekend! I wish I would have kept up with the glaminars. I totally would have come.